It was quite natural for Wyatt Earp to gravitate to Gower Gulch, the intersection of Sunset Boulevard and Gower Street in Hollywood, where unemployed Southwestern cowboys gathered daily in search of work in the new moving picture industry. Many old pals from his Arizona, Nevada and Alaska days were there. They would swap tales, warmly recalling the dead past as old men so often do. They also took note of the growing popular interest in all things Western, for as the generation that had tamed the West began to fade away, the public could not get enough of their adventures—both real and imagined. The movies offered hope for one final payday for old men desperate to support themselves in their waning years. Buffalo Bill Cody, Charlie Siringo, Emmett Dalton, Henry Starr and Bill Tilghman all tried their hand at the newfangled moving pictures. Earp, always on the lookout for the main chance, saw Gower Gulch as one last boomtown. 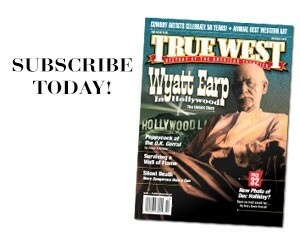 Earp met several important Hollywood players, for stories of his Western adventures had circulated throughout the new film community. Directors Alan Dwan, John Ford and Raoul Walsh all sought him out. Of course, historical accuracy is not among the many virtues of Ford’s transcendent 1946 version of the Tombstone saga. So either Earp or Ford, or both, could not get the story straight. Hart could not have sold Earp’s story to the studios, even if he had wanted to. By 1925 his star was in decline. 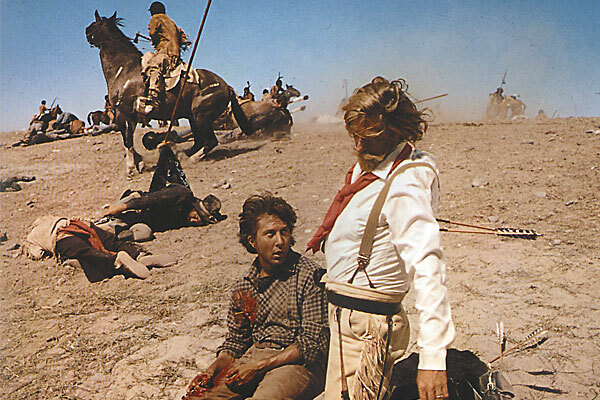 That year Hart’s final film, Tumbleweeds, was released. While Hart never developed the Earp story into a film, he was the first to introduce Earp as a character in a film. The seven-reel epic Wild Bill Hickok, released by Paramount in 1923, featured both Earp and Bat Masterson as important characters. It was also the first film to portray Doc Holliday on screen. Hart wrote the original story, which J.G. Hawks turned into a film scenario, centering on Hickok’s return to gunfighting in order to assist the “Dodge City Peace Commission” of Masterson, Earp, Holliday, Charlie Bassett, Luke Short and Bill Tilghman in cleaning up the wild cowtown. (Hickok, Holliday and Tilghman were not historically part of the group.) The usual romantic entanglements made the job all the more difficult for Hickok, but, of course, he prevailed over the villain in a climactic final showdown. “Back in the days when the West was young and wild, ‘Wild Bill’ fought and loved and adventured with such famous frontiersmen as Bat Masterson and Wyatt Earp,” ran promotional copy for the film over Hart’s byline. 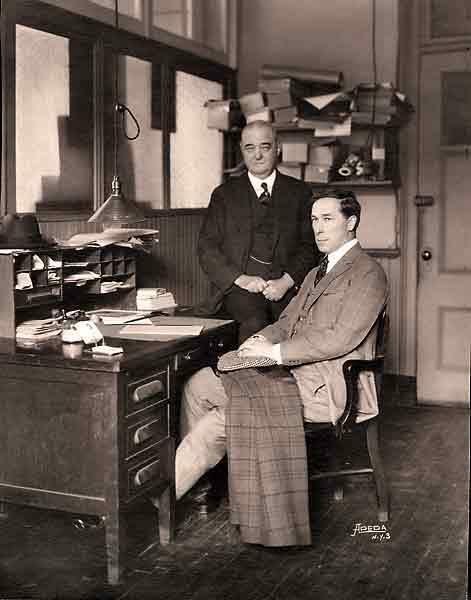 Earp was naturally flattered by Hart’s portrayal of him on film, but there is no evidence he visited the set or consulted with Hart in any way. He did not help in promoting the film, as Bill Tilghman did when it played Oklahoma City. Audiences around the country, film critics and studio bosses did not share Mrs. Earp’s enthusiasm for the film. Its box office failure helped to end Hart’s already fading career. Hart’s film failed to bring Earp the fame, redemption and financial security he craved. The old frontiersman had been correct, however, when writing Hart in 1925 that the movies might yet set the record straight. 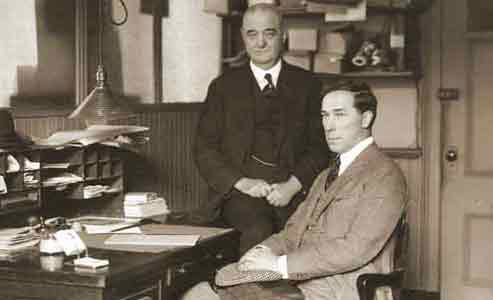 When Earp died at his rented Los Angeles bungalow, with Josephine at his side, on January 13, 1929, he could not have imagined that Hollywood would make him into a towering international legend. 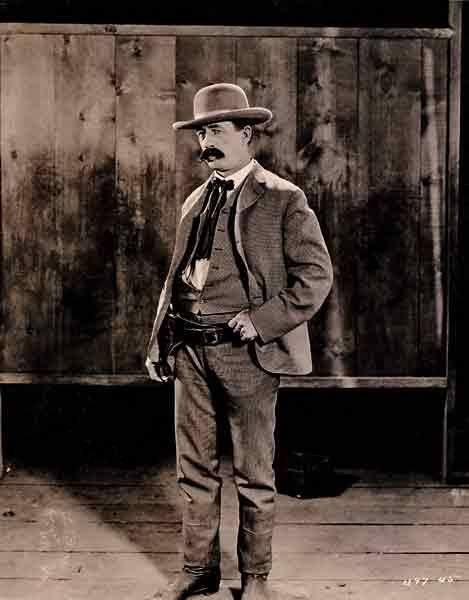 With over 30 Earp films to date, Hollywood ended up most instrumental in creating and nurturing the image of Earp as the archetypical frontier lawman. As an honorary pallbearer at Earp’s funeral, Hart helped to lay the real man to rest. But with his 1923 film Wild Bill Hickok, he had given birth to the legendary celluloid marshal. Paul Andrew Hutton is distinguished professor of history at the University of New Mexico. His latest book is Western Heritage from University of Oklahoma Press. 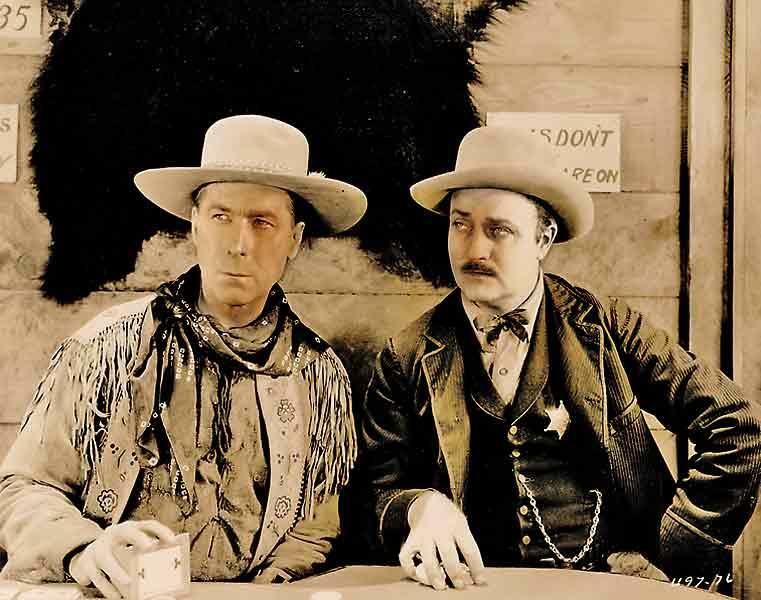 Hart as Wild Bill Hickok with Jack Gardner as Bat Masterson in the 1923 film. Bert Lindley as Wyatt Earp in 1923’s Wild Bill Hickok. 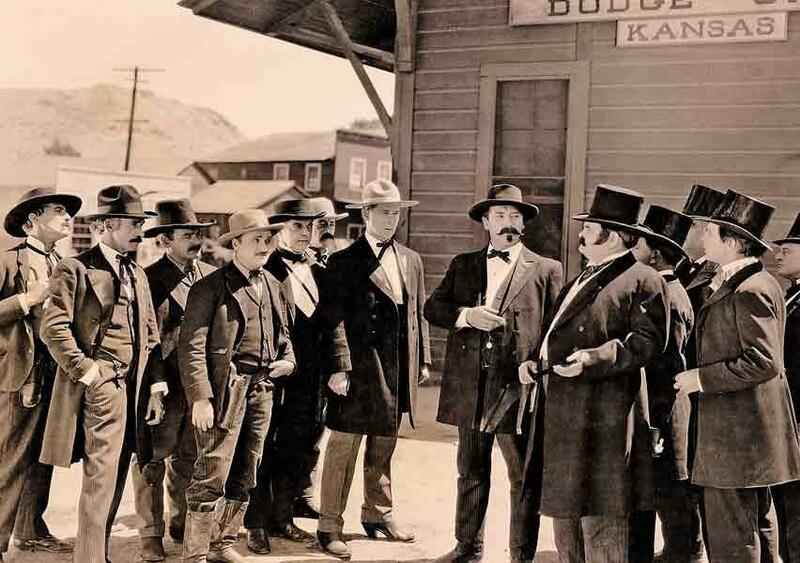 The studio caption reads: “The Dodge City Peace Commission meets the pompous buffalo hide buyers, the silk hat brigade, from Boston.” William S. Hart as Hickok, Jack Gardner as Masterson and Bert Lindley as Earp make up the commission, with unknown actors in the group playing Doc Holliday, Bill Tilghman, Luke Short and Charlie Bassett. Hart as Hickok with Ethel Grey Terry as Calamity Jane. 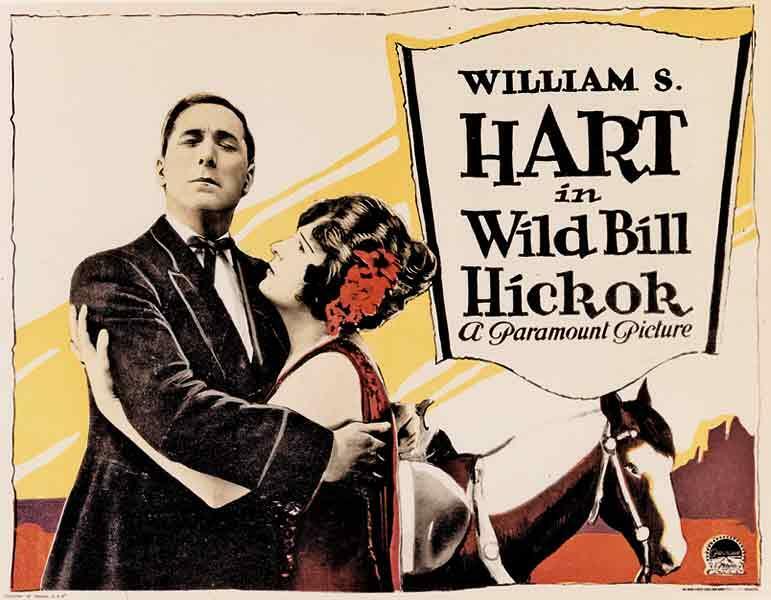 Hart’s famed pinto Fritz is in the background of the movie’s lobby card. Close-Ups on the Outcasts Arthur Penn discusses the first “revisionist” Western and Bonnie & Clyde’s link to the genre. Texas Rangers Epic Event “The Alamo wasn’t the end. It was the beginning,” promises the History Channel in a new miniseries that premieres on Memorial Day.